VapingDaily creates the best vaping offers around the Internet to let our visitors use the best vaping products by the most beneficial prices. Today we offer famous KandyPens vape products 20% cheaper. 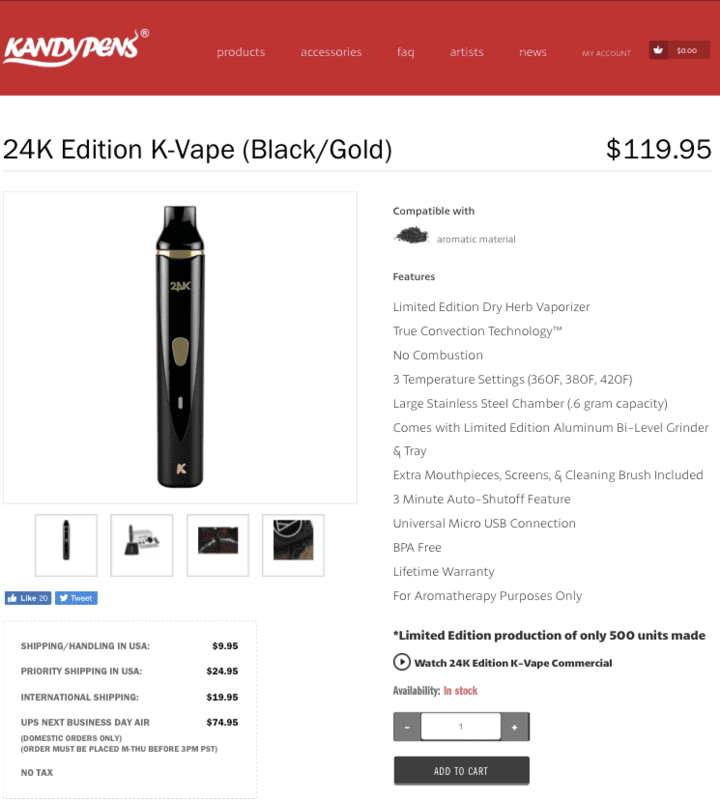 While the promo code Kandypens discount isn’t listed on their site, it nonetheless still works. The process is simple and identical on both computers and mobile devices. Save 20% off to order KandyPens products with our exclusive KandyPens coupon! Click Reveal Code button and go to the official KandyPens website to get 20% discount! The popup asks to approve you’re a legal age for vaping. So Click yes if you’re 21 years old or above. Next pop-up offers you to write down your e-mail. To start shopping by a special VapingDaily’s discounted prices close it and choose your product. Go to the product menu and make your choice. All the products except already discounted could be added to your order and the discount will apply to it. To apply the discount code go to your cart and right under the order listings find the line “discount code”. Paste or type the promo code by VapingDaily and click the button “apply coupon”. Check your order summary on the right to make sure the discount is counted. 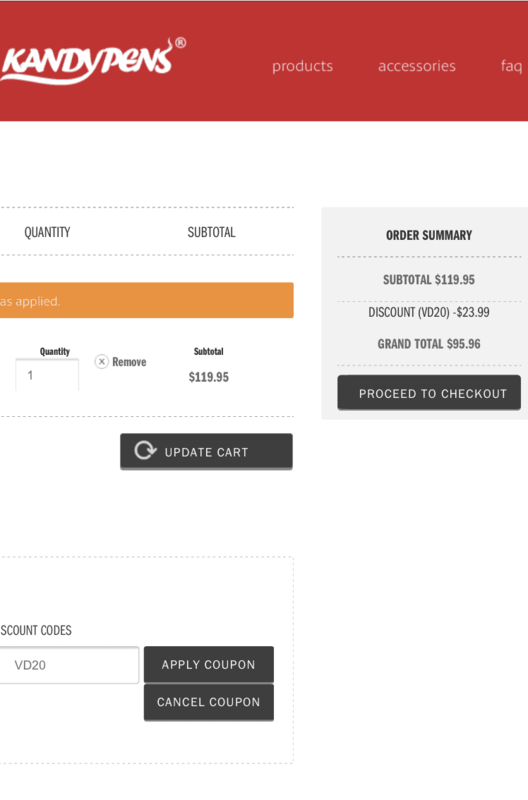 Then just click “Proceed to checkout” button. Provide the billing address if you are not registered user of the Kandypens website. 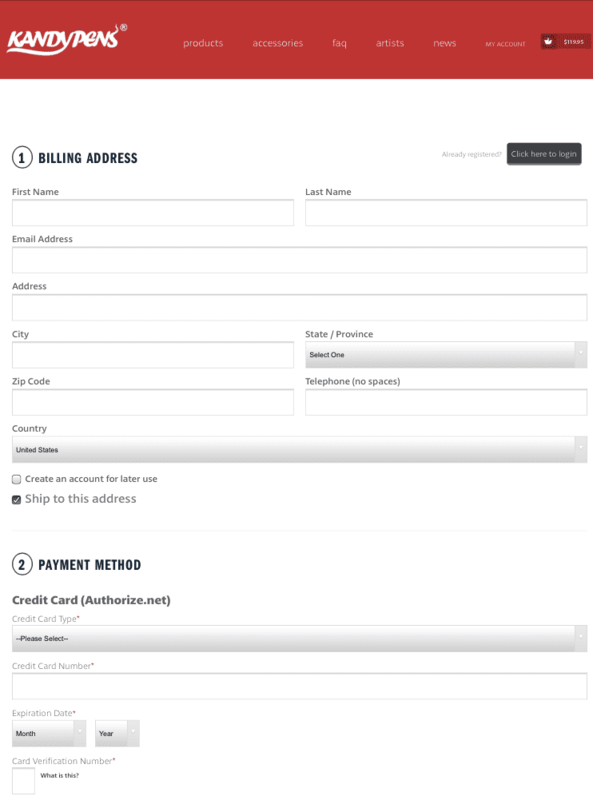 On this step, you’ll be asked to choose the payment and shipping methods. Already registered users need to log in and finish shopping. Carefully check the order review to convince everything you have been looking for is on the list. Also, check if line “discount” appears in subtotal. After that just place the order and wait for your Kandypens products bought at a lower price. Open a web browser. 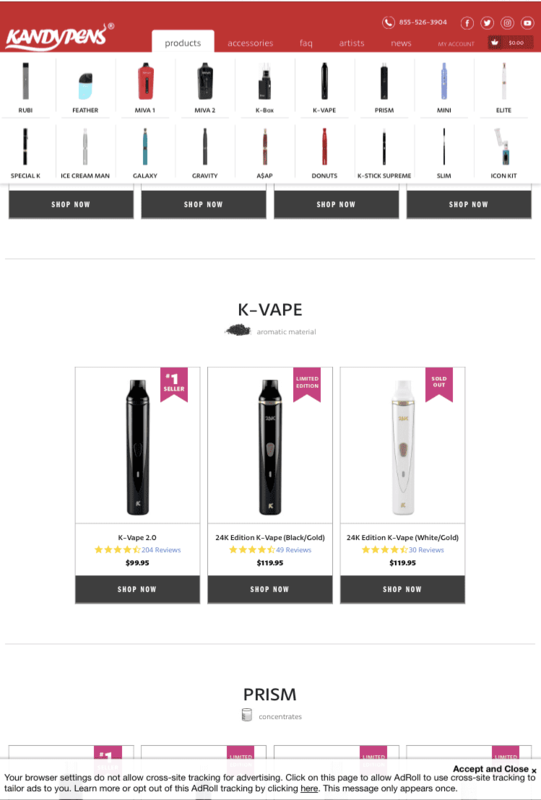 Type or copy/paste the following link in the address bar https://vdlink.co/kandypens-store/ and press “Enter”. “Enter” might appear as “Done” or “Go” on a mobile device. 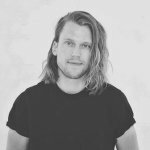 The link will lead to the Kandypens website. Click on “I AM 21+” only if you’re of this age or above to proceed. If not the age of majority for purchasing vape products, select “UNDER 21+”, as it is illegal for minors to buy vaporizers or related items. 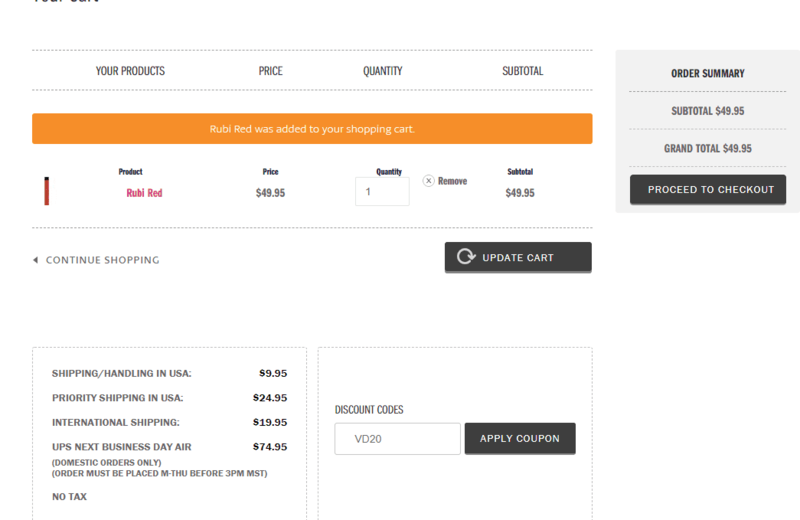 After verifying age, the next screen will show a popup requesting an e-mail to ultimately obtain a coupon code. Disregard this and close the message by pressing the “X” in the top right corner of the ad. 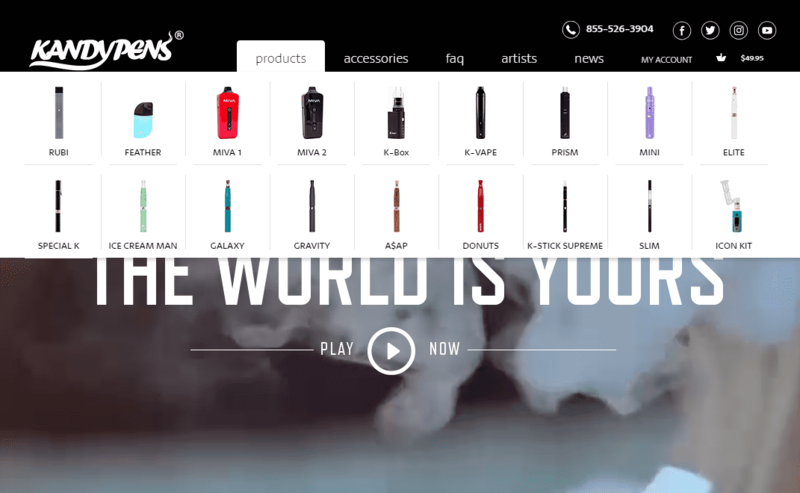 Although their offer does provide 20% off like the Kandypens promo code from Vaping Daily, it isn’t the same discount. Closing the popup brings the user back to the main site. 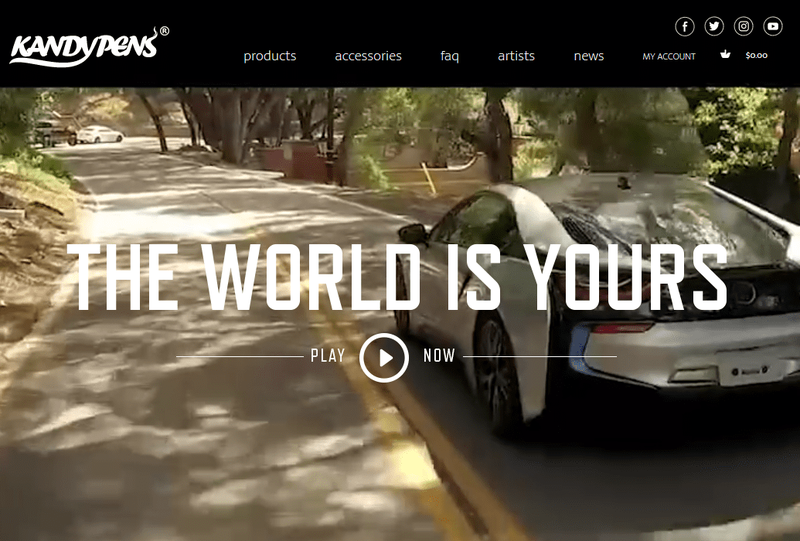 From here, click on “Products” or “Accessories”, depending on the desired item. “Products” (highlighted in green) will be used for the purposes of this demonstration. After hovering the mouse over “Products” (or “Accessories”), a list of available brands will appear below. Don’t click on the “Products” tab, as this either does nothing, or sometimes pulls up an unrelated spam site that could contain viruses or malware. For demonstration purposes, we will choose “RUBI”. 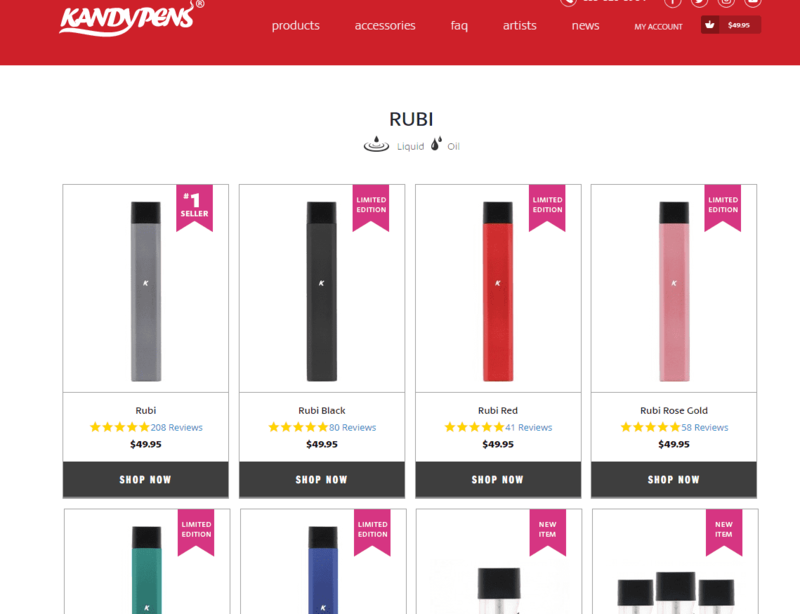 Again, the Kandypens coupon applies to everything in the store, so select any desired brand. 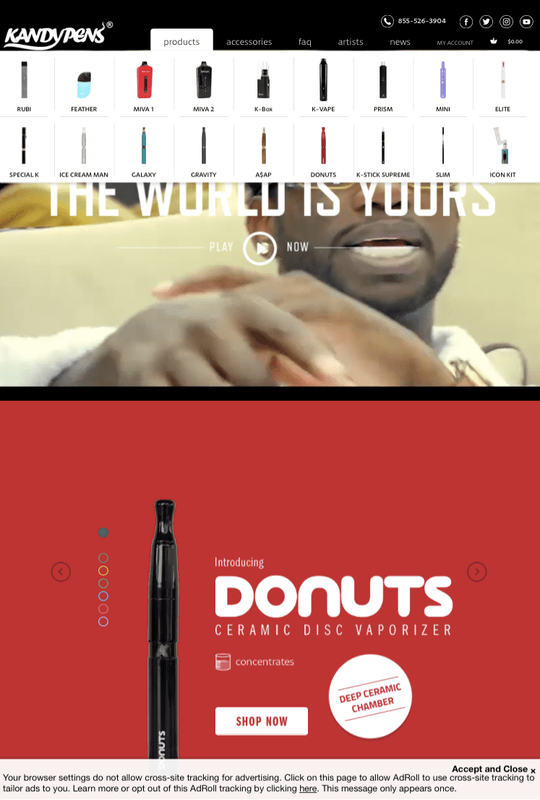 The next screen shows a list of all of the products (in this case, vape devices) for the specific brand. We have selected “Rubi Red” for illustrative purposes. Scroll down on the screen using the scrollbar on the far right side of the browser. 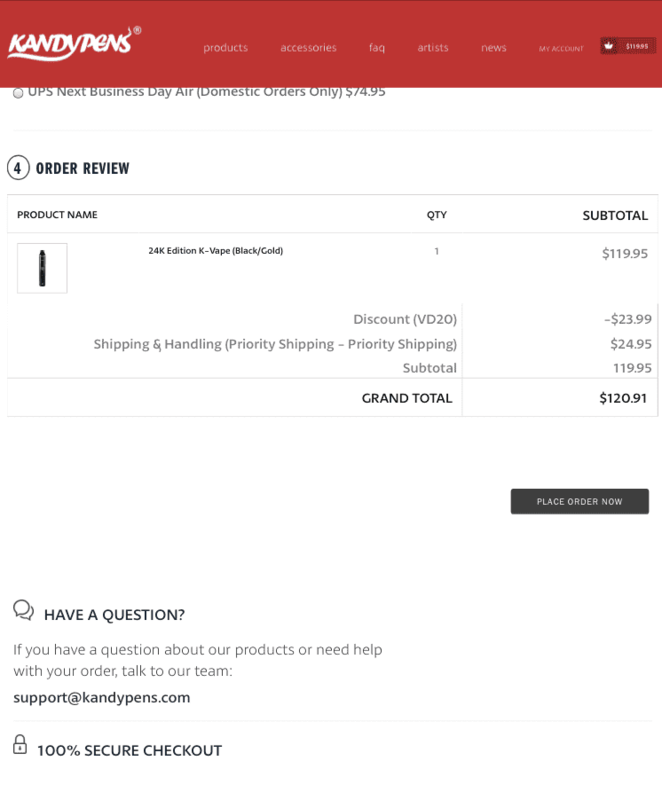 Eventually, the “ADD TO CART” option will be visible, as shown below. Click this button to proceed. After clicking “ADD TO CART”, the below screen will appear. 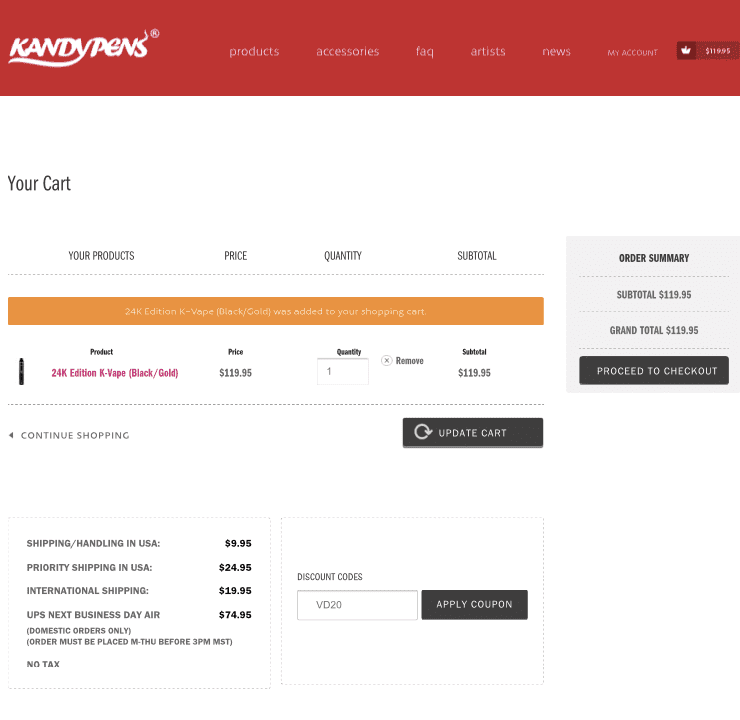 At this point, the option to enter the Kandypens discount code will be available. Type “VD20” in the “DISCOUNT CODES” field (highlighted in green), then click “APPLY COUPON”. 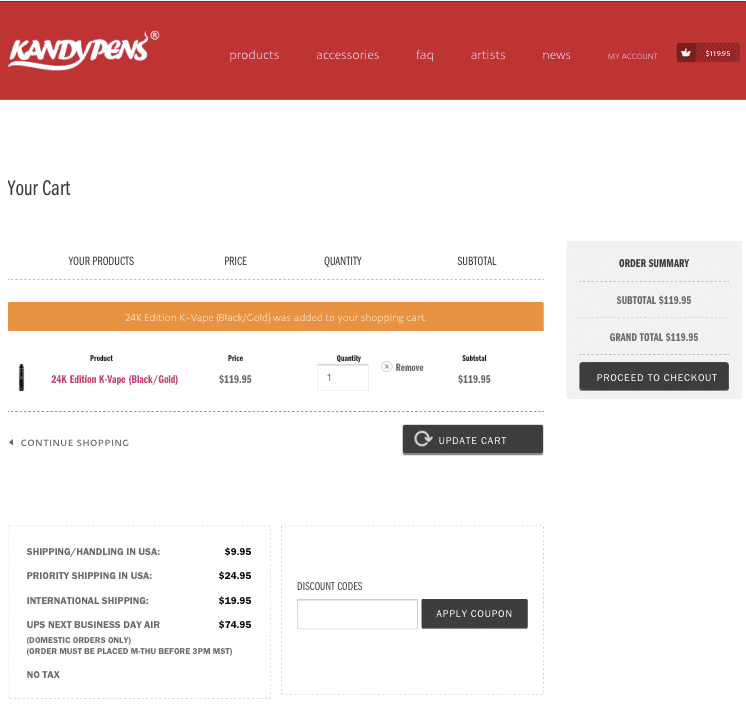 After entering and applying the Kandypens promo code, select “PROCEED TO CHECKOUT”. The 20% discount will not reflect on this screen. It will be applied upon completion of the purchase. The next few screens will involve entering the relevant shipping and payment information, at which point, the code application can be confirmed. Vaping Daily offers a lot of lucrative deals on a variety of different brands and products. Keep checking every month for new bargains on the most popular vapes and accessories.